How do you know that the cookies are still there although they have been placed out of your sight into the drawer? How do you know when and where a car that has driven into a tunnel will reappear? The ability to represent and to track the trajectory of objects, which are temporally out of sight, is highly important in many aspects but is also cognitively demanding. Alice Auersperg and her team from the University of Vienna and Oxford show that "object permanence" abilities in a cockatoo levels apes and four year old human toddlers. The researchers published their findings in the journal Journal of Comparative Psychology. For investigating spatial memory and tracking in animals and human infants a number of setups have been habitually used. These can roughly be subdivided depending on what is being moved: a desired object (food reward), the hiding places for this object or the test animal itself: In the original invisible displacement tasks, designed by French psychologist Jean Piaget in the 50s, the reward is moved underneath a small cup behind one or more bigger screens and its contents is shown in between visits: if the cup is empty we know that the reward must be behind the last screen visited. 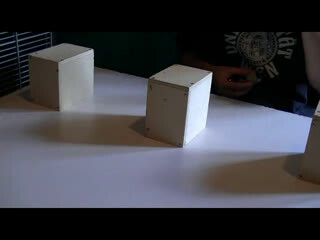 Humans solve this task after about two years of age, whereas in primates only the great apes show convincing results. Likely to be even more challenging in terms of attention, are "Transposition" tasks: the reward is hidden underneath one of several equal cups, which are interchanged one or more times. Human children struggle with this task type more than with the previous and do not solve it reliably before the age of three to four years whereas adult apes solve it but have more trouble with double than single swaps. In "Rotation" tasks several equal cups, one bearing a reward are aligned in parallel on a rotatable platform, which is rotated at different angles. "Translocation" tasks are similar except that the cups are not rotated but the test animal is carried around the arrangement and released at different angles to the cup alignment. Children find Translocation tasks easier than Rotation tasks and solve them at two to three years of age. A team of international Scientists tested eight Goffin cockatoos (Cacatua goffini), a conspicuously inquisitive and playful species on visible as well as invisible Piagetian object displacements and derivations of spatial transposition, rotation and translocation tasks. Birgit Szabo, one of the experimenters from the University of Vienna, says: "The majority of our eight birds readily and spontaneously solved Transposition, Rotation and Translocation tasks whereas only two out of eight choose immediately and reliably the correct location in the original Piagetian invisible displacement task in which a smaller cup is visiting two of three bigger screens". 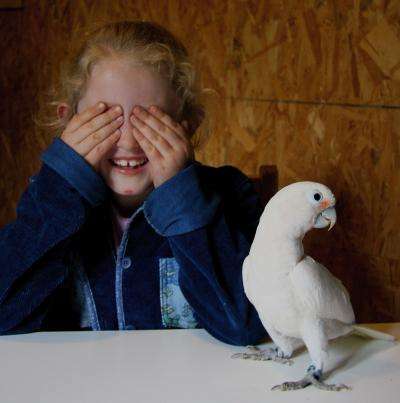 Alice Auersperg, the manager of the Goffin Lab who was also one of the experimenters, explains: "Interestingly and just opposite to human toddlers our cockatoos had more problems solving the Piagetian invisible displacements than the transposition task with which children struggle until the age of four. Transpositions are highly demanding in terms of attention since two occluding objects are moved simultaneously. 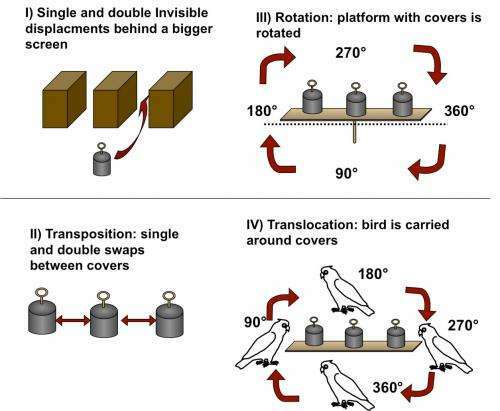 Nevertheless, in contrast to apes, which find single swaps easier than double the cockatoos perform equally in both conditions". Similarly, Goffins had little complications with Rotations and Translocation tasks and some of them solved them at four different angles. Again, in contrast to children, which find Translocations easier than Rotations, the cockatoos showed no significant differences between the two tasks. Auguste von Bayern from the University of Oxford adds: " We assume that the ability to fly and prey upon or being preyed upon from the air is likely to require pronounced spatial rotation abilities and may be a candidate trait influencing the animals' performance in rotation and translocation tasks". Thomas Bugnayer from the University of Vienna concludes: "Finding that Goffins solve transposition, rotation and translocation tasks, which are likely to pose a large cognitive load on working memory, was surprising and calls for more comparative data in order to better understand the relevance of such accurate tracking abilities in terms of ecology and sociality".